Catherine Ingram is a freelance art historian. She obtained First Class Honours at Glasgow University as a Honeyman scholar and then, after an MA in 19th-Century Art at the Courtauld Institute of Art, became a graduate scholar at Trinity College, Oxford. Catherine has taught on the MA course at Christie’s and lectured at Imperial College. Andrew Rae is an illustrator and member of the illustration collective Peepshow. 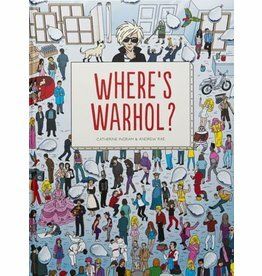 Spot Andy Warhol in iconic, worldwide locations as he and his famous friends pop up in 12 spectacles of art history.